You get sick and all you want is to get your health back. But so many of us that experience ME/CFS, Fibromyalgia, POTS or other variations of this syndrome can’t even get their illness acknowledged as real, let alone treated effectively. With countless books having been written about treating the dysfunctions and symptoms of this syndrome, you have to ask yourself; WHY haven’t they worked for you? Why do people get the illness in such different ways? Why do people experience so many different symptoms? Is a full and lasting recovery even possible? 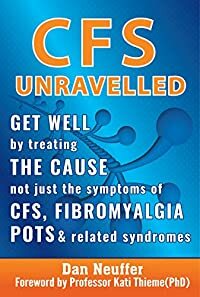 CFS Unravelled answers these important questions by delving deeper into the pathogenesis of the illness that connects the different symptoms and dysfunctions that you experience. This comprehensive understanding allows you to tailor a path to recovery that allows your body to return to health naturally, as opposed to trying to fix every system and symptom that you are experiencing.